Are You a Resident or Visitor? The paradigm maps people’s behaviour on a continuum and individuals can identify themselves along the range, with Digital Resident and Visitor as extremes on both ends. The main element that differentiates a Digital Resident and a Digital Visitor is their online presence. A Resident displays his communal footprints over the web, revealing his opinions and ideas through several platforms such as posting of reviews on social sharing sites and discussing actively in forums. The virtual space is more akin to a “place” that encourages social exchange of information. On the other hand, a Visitor chooses to be anyomnous and does not establish his online presence. A Visitor comes across as goal-oriented, exits the online network once he has attained his goal (e.g. To search for information). Using online technology as a “tool”, he may not interact with others as much as a Visitor will do. Social media sites can be also an entry point for a Visitor to look for information. Compared to Prensky’s “Digital Natives and Immigrant”, these above metaphoric terms do not relate to competency distinction. On surface, a Resident may seem much technically adept but that does not determine the level of digital literacy. For instance, a Resident may not show efficiency in information gathering because he habitualises around chat applications. However, a Digital Visitor may be more efficient in research as the basis of the task does not require any social interaction and is able to gather information objectively. Hereby, emphasis should be placed on how people decide to engage with online technology in relevance to their motivation. And that will determine how they are placed along the continuum. Factors such as perception of online technology (i.e. privacy and security), context and situation may be the underlying reasons why an individual aligns closer to being a Digital Resident or Visitor. Individuals may exhibit the behaviour of either one in different context. In my case, I am considered as a Digital Resident in private terms. However the rapid emergence of new online applications do make it a challenge to keep up. Hence, I display a Resident approach on social sites such as Facebook and Instagram; but when it comes to others (e.g. Tumblr, Twitter), I’m a Visitor in that sense. Under professional terms, I take on the role of a Visitor; searching for job vacancies when it is needed and I do not maintain a professional identity (i.e. LinkedIn). OCLCResearch, (2015). Digital Visitors and Residents: What Motivates Engagement with the Digital Information Environment?. Available at: https://www.youtube.com/watch?v=ZCBoLWynsl8 [Accessed 30 Oct. 2015]. White, D. S., & Cornu, A. L. (2011). 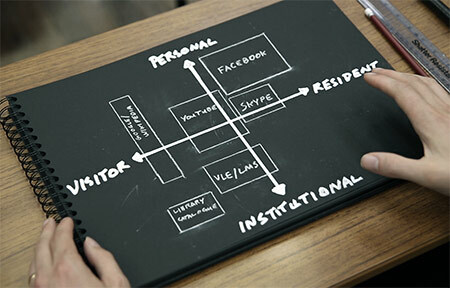 Visitors and Residents: A new typology for online engagement. First Monday, 16(9). University of Oxford, (2014). Simple Visitor & Resident map. [image] Available at: http://tallblog.conted.ox.ac.uk/index.php/category/projects/visitors-and-residents/ [Accessed 30 Oct. 2015]. I really liked the part where you highlighted how even though a resident may seem technologically proficient, it does not mean they are highly literate in it. Even though a resident may spend a lot of time online, it does not mean that they know the functions well enough or are able to navigate their way efficiently through the digital tools. I find that really true, a resident is considered a resident just because he/she resides online and also because they managed to establish a strong presence. “Residents” usually spend a lot of time online doing things that are in fact of a certain purpose just like the “visitors”, but they are more engaged in it. However, being a “resident” means that they need to have a strong presence online, which I don’t necessarily think so. What are your thoughts about this? Enjoy reading your insight about this topic! I agree on your point of view about the degree of competency for digital resident and visitor. Therefore, I feel that when people are using the web, it is important for them to get a balance on both approach and not placed themselves in the extreme end. By having a balance of skills between being a visitor and resident help them to develop the ability of finding and evaluating valid information to post online as well as taking social media as another channel of finding information. Another view that I find it interesting is you explaining yourself as a visitor for Tumblr and Twitter and it make me realised that even if I have an account for a particular social media platform but not being active in it can also be consider as taking a visitor approach in the internet. I find your post to be a refreshing read as it brings in new perspectives on this topic. In the third paragraph, you said that a digital visitor may be more efficient in research as compared to a digital resident who uses Internet mainly for chat applications, and I have found this perspective very interesting. In the articles I have read, there is an underlying assumption that Digital Residents are undoubtedly more efficient and literate in the digital world as a whole, and this includes using Internet for work research and personal issues. But you have pointed out in your post, that even though Digital Residents have a stronger online presence, their online presence are only mainly for social uses which often does not require as much skills needed for effective work research and other purposes. Digital Visitors, as you have described, are goal-oriented and may be making meaningful use of the internet. By shining light on this new perspective, it has definitely intrigued me to find out deeper meanings and behaviours of the Digital Residents and Visitors.